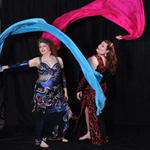 Su'ad and Farasha invite you to another exciting evening of dance! Join us as we share an evening chock full of beautiful dancers and dances of all styles. The Desert Moon Dancers will be there, premiering a special, new number. You won't want to miss this one!